Physalis peruviana (physalis = bladder) is the plant and its fruit, also known as cape gooseberry (South Africa), Inca berry, golden berry, giant ground cherry, Peruvian groundcherry, Peruvian cherry (U.S.), poha (Hawaii), ras bhari (India), aguaymanto (Peru), uvilla (Ecuador), uchuva (Colombia) and (rarely) physalis. 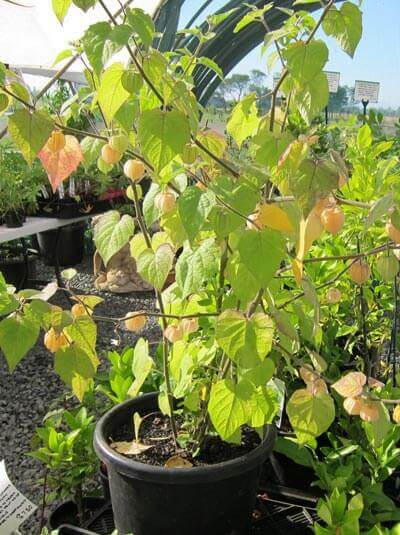 It is indigenous to South America, but was cultivated in South Africa in the region of the Cape of Good Hope during the 19th century, imparting the common name, cape gooseberry. The fruit is a small round berry about the size of a marble, with numerous small yellow seeds. It is bright orange and sweet when ripe, making it ideal for snacks, pies or jams. It is popular in fruit salads, sometimes combined with avocado. Its most notable feature is the inflated, papery calyx enclosing each berry. Because of the fruit's decorative appearance, it is sometimes used in restaurants as an exotic garnish for desserts.